Medical waste is a subset of wastes generated at health care facilities, such as hospitals, physicians' offices, dental practices, blood banks, and veterinary hospitals/clinics, as well as medical research facilities and laboratories. Generally, medical waste is healthcare waste that that may be contaminated by blood, body fluids or other potentially infectious materials. Waste in this category should be properly disposed of and management. Improper management of like needles and other sharps poses a health risk to the public and medical workers. For example, needles expose health workers to needle injuries and therefore infection. Janitors and house keepers are also under threat. Used needles can also transmit diseases such as HIV and Hepatitis. 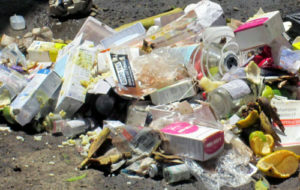 We have a highly experienced team that can take care of your waste needs in this category.